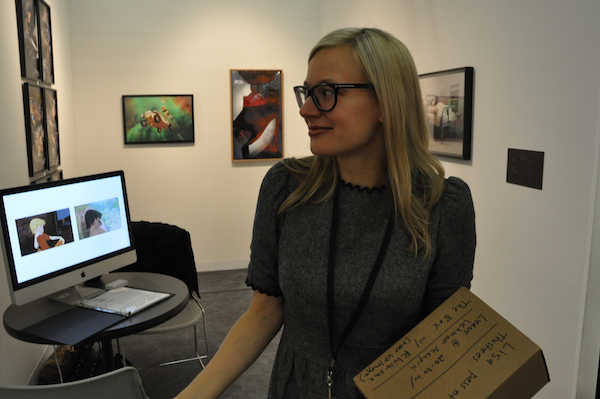 Last month, we learned that Paddy Johnson of Art Fag City curated a show of animated GIFs and now I’ve discovered that Lauren Cornell, the executive director of Rhizome, is selling these often trippy nuggets of Graphics Interchange Format files at the 2011 New York Armory Show. That’s right, Cornell is a pixel pusher. She’s got a bunch of adorable online graphics that flicker on our computer screens and mobile devices available for sale right now at New York’s premiere art fair. Get ’em while they last. But there were so many questions swirling in my head about how you can buy pixel-based art, so I had to ask Cornell the big question, how does this work, exactly? Here is her answer on my little guerrilla interview video during the press preview of the Armory yesterday.